(1) A high impedance voltmeter (preferably a digital) with one alligator clip. (2) A small safety pin opened up to form a 90 degree angle. (3) Depending on the type of fasteners that hold your TPS in place; the tools needed to loosen and retighten them. Mine had bolts with a combination Philips screw driver and 7MM nut head. Some have only a screwdriver head and need a 90 degree bend screwdriver or screw driver tips for a ratchet drive. These screw driver head only bolts are the pits and most owners have replaced them after removing the throttle body. Make sure your engine ground points are clean and tight. An additional grounding strap for the throttle body or extension manifold to the firewall is a good idea to keep your engine's electrons flowing freely. (1) 2nd from top (green wire with red stripe), this goes to the 3F ECU connector. Closed throttle +V range is 0.75 to 1.25. Fully opened throttle +V range is 4.8 to 5.0. (2) Bottom (black wire with green stripe), this goes to the 3G ECU connector. Closed throttle +V range is 0.1 to 0.7. Fully opened throttle +V range is 4.2 to 4.6. (1) Start and run engine until at normal operating temperature and the fast idle cam is at normal idle position. (2) Turn off the engine. body. This is to give you easier access to the TPS bolts. room to access the TPS bolts. If extra room is still needed, remove the pressure sensor from the firewall. (5) Totally loosen the bottom TPS bolt and partially the top one. (6) Connect the negative volt meter lead to a good ground point. I used one in the diagnostic connector since it goes to the ECU. (7) Insert the safety pin point into the TPS 3F or 3G connector (see above) between the rubber weather seal and the wire. Using the alligator clip, attach the positive voltmeter lead to the safety pin head. Select the appropriate voltmeter range. Be sure not to accidentally ground this lead! (8) Turn the ignition on without starting the engine. If there isn't a voltmeter reading, adjust the safety pin until it does have a reading. (9) Record the voltages for closed and fully opened. Open the throttle fully by hand, not the accelerator pedal. (9a) Verify that the voltages increase as the throttle is opened. Look for "dead" spots or voltage fluctuations as you slowly open the throttle. (10) Do the same for the other TPS connector point. (11) If any of the four voltages are out of range, loosen the top TPS bolt and adjust the TPS until all four are in range. 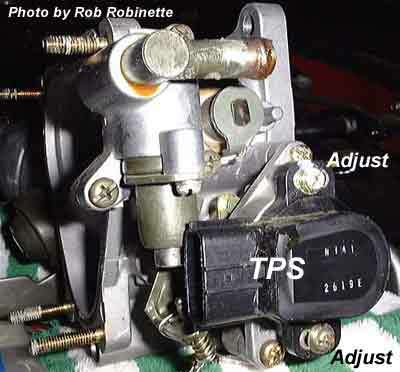 If all four can't be adjusted correctly; then either the TPS is bad, the fast idle cam is still engaged, or the idle set screw on the throttle is way off normal position. NOTE: The further the idle set screw on the throttle is adjusted down (throttle opens up), the higher the low end readings will be if the high ends are good. That's because the arc of throttle movement will be shifted towards the high end. Try and imagine the geometry of the throttle rotating shaft connected to the TPS which is nothing but twin variable resistors like a volume control on a stereo. Even though I had all four in their voltage ranges, my PMC would not read WOT. I adjusted the TPS just until WOT occurred, and then rechecked the four voltages. They were still good but shifted towards the high end of their ranges. WOT is only needed for vent learn. My 3K stumble wasn't bad until forcing my TPS to show WOT on the PMC, then it got worse! (11a) Adjust your throttle linkage to insure that you also get WOT from your accelerator pedal. I had to also do this. (12) Tighten up the TPS bolts, verify the voltages are still within range and put everything back together. Drive the car a little, then readjust your idle air bleed screw if needed.